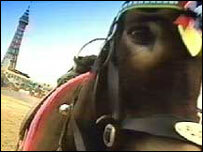 Blackpool's famous horse carriages which ride along the promenade could soon be fitted with "dung-catchers". The resort's council is to decide whether to fit the horse nappies on the 44 landaus - the carriages pulled by horses. A consultation found that visitors, residents and businesses said the manure detracted from the attractiveness of the seafront. If approved, the dung-catchers will be used from Easter onwards. They will be given to the landau owners free of charge. Councillor Ian Fowler, deputy leader of Blackpool Council, said: "Whenever we ask people what's important to them its cleanliness that always appears high on their list. "We have been working closely with the Landau owners to modify the device and have been consulting with an equine expert and the RSPCA to ensure that the horses' welfare is not compromised in any way." The dung-catchers will be considered by the Licensing Committee on 22 November.